Mindful Design Consulting Newsletter (November 2013) Is Your Company Branded Enough? My favorite time of year is here! It's time to celebrate and to thank ourselves and others for everything we have in our lives. It's also time to contemplate on how far we got in our businesses and in personal lives. Today's newsletter is a quick look at your company from a branding point of view. Take this short (5 questions) quiz and see if you are doing enough to attract a customer of your dream and to stay competitive in this uprising market. You can find this and other interesting design suggestions on our Blog. In our Green News corner, take a look at this great idea on how to get citizens into a great shape! 30 squats for a free metro ride is now available in Moscow! IS YOUR COMPANY BRANDED ENOUGH? How well do you think you branded your company? Do people know what you are offering without even entering into your store? Do they feel comfortable inside your premises? What is your future goal in your company's branding? This quick quiz will test your basic company's branding health. 1. Do you have a professionally designed logo? Do you have a professionally designed logo that you like personally? I am talking about a logo that is easily recognizable, memorable, a logo that can be printed on any marketing materials or embroidered on shirts. In addition to that, do you have a vector file of your company's logo with indicated fonts that your designer used? You may need it at any moment in the future if you decide to redesign your website or produce any other graphics for your marketing campaign. Check out some of the logos that Mindful Design Consulting designed. Above is an examples of a few options Mindful Design Consulting provides to clients during design process. 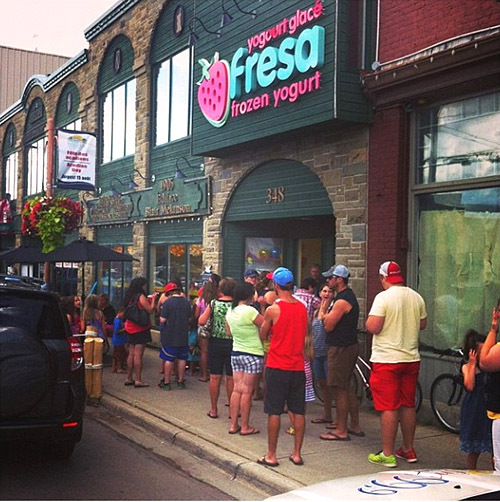 Fresa is a new yogurt shop brand we created in Canada this year. The client picked option #8 and after a few small changes it became a final company's logo. 2. Do you know your company's PANTONE colors? Do you know your company's PANTONE colors? These are usually colors that your logo was designed in and that you should use throughout your interior and marketing materials. Your company's colors are very important as part of your brand. That is how people will emotionally relate to your brand. Your graphic designer should have provided you with these colors when he/she delivered your final logo. Your interior designer should also use these PANTONE colors or their variations to create your interior which will represent your brand. Above is an example of a logo for San Francisco Pacific Academy that Mindful Design Consulting designed. You can see PANTONE colors of the logo that can be used for any printed materials of the school. Here is a color guide of emotions associated with colors that a Logo Design company put together. See if you can identify your company logo's emotional message. 3. Do you have well designed outside signage? Do you have well designed outside signage that is not faded or missing letters? Outside signage is a very important element of your brand. If you do not have a well designed sign, nobody will want to go into your business. 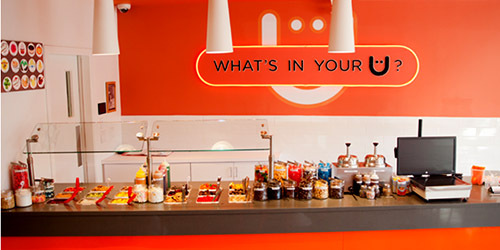 Above is an example of a successfully designed signage for Fresa Yogurt Shop. You can see Fresa's final logo here in action. 4. Can you state your company's top-five brand attributes? Can you state your company's top five brand attributes — the most relevant and compelling adjectives that describe your company's service? This is a tough one if you never wrote a business plan, but maybe this is the time to refine your image. Are you Personable? Healthy? Fast? Reliable, or Environmentally Conscious? And does your logo and overall interior branding represent that image? Above are photos of Kulture Frozen Yogurt brand we designed in Canada. Orange colors and overall style burst with energy and optimism. This store is on a way to attracting young crowds and people young at heart by creating a new culture and a strong brand. See more pictures of Kulture Frozen Yogurt store HERE. 5. Do you like spending time at your business location? Do you like spending time at your business location (retail store or office)? Or do you feel drained as you walk in? If you do not like your business location, it means it needs improvement. Your business is the face of your company. In addition badly designed interior will make you (and your employees) more tired and unproductive. Check following elements around your space: wall paint condition, any scratches on walls, ceiling tiles missing, carpet or flooring condition, sufficient lighting, health of life plants in your space, any bad smells, or any annoying repetitive sounds. One more thing, do you have something on your walls to stimulate your mind during short breaks? I usually surround myself with photos or sketches from my travels. I also have a few plants at my office. I try changing from siting on my chair to sitting on my yoga ball during regular work day. The colors that I picked to decorate my office are light gray and bright yellow. Yellow color is known to elevate mood. Grey color keeps me organized. 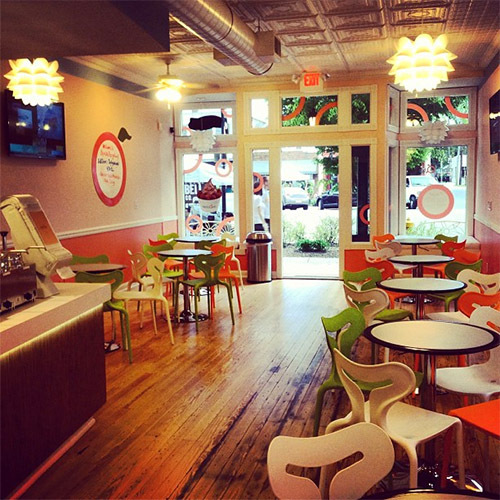 Above is Apricato's 3rd location (Apricato Frozen Yogurt Store), which opened in a beautiful historical neighborhood in OH. We had to combine slick contemporary style of Apricato's brand with a beautiful traditional neighborhood. Also, take a look at “Branding By Interior”e-book, the only book written on this subject at this time. It brings insight on how you can turn your business into a market-dominating competitor by using human cognitive responses. Russia is pulling out all the stops for the upcoming Sochi Winter Olympics, but they’ve now taken it to another level. Apparently, having fit athletes to represent the country isn’t enough. 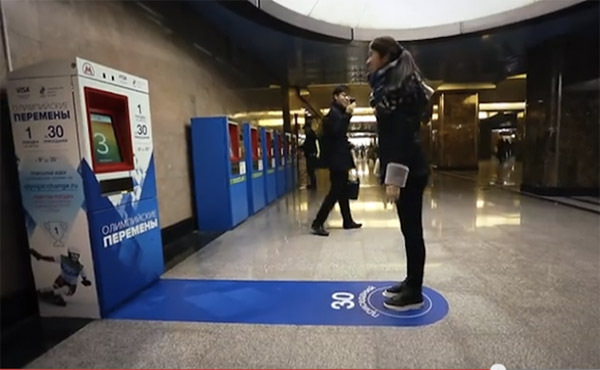 In order to encourage Russian citizens to get in better shape, the government has come up with an unusual incentive: commuters in Moscow will receive a free subway ticket, which costs 30 rubles or $0.92 USD, if they can perform 30 air squats in front of special automated transit machines that can tell if you’re cheating... Read more HERE.